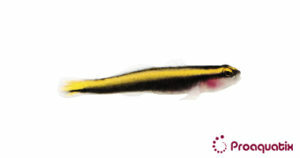 A bright yellow reflective stripe runs through the length of this goby. Its body color is otherwise black dorsally and white ventrally. This species lives in groups and forms cleaning stations. Larger fishes come to these stations to allow cleaner gobies to remove dead skin, parasites, and other edible debris as food. Unlike many cleaner animals, cleaner gobies will also eat regular fish food and can therefore live a long time in a captive environment. As a cleaner species, this fish will pick parasites and dead skin from the gills, mouth and skin of larger fish. These gobies are compatible with most other species but can become prey to animals that are ambush feeders like mantis shrimp.